You might have noticed that I've been posting a lot of original recipes lately. I'm officially done with grad school now, and I am taking some time off to relax and do some career-related introspection, along with lots of cooking, of course! Creating my own recipes is a little project that I've been working on now that I have more free time. I still spend plenty of quality time with my cookbooks and reading food blogs/websites, but the recipes I see serve mostly as inspiration as I develop my own ideas. This inspiration for this fried rice recipe came from both a cookbook and a blog. I was flipping through one of my favorite cookbooks, Ottolenghi's Plenty, last week and a recipe for mango and coconut rice salad caught my eye. And then I saw Lauren's recent post about kale salad with mango and avocado which also looked pretty tasty. I don't know if it was the incredible warm weather last week, but I was really craving tropical fruit! Anyway, those two salad recipes ended up getting merged in my mind and morphing into this fried rice. It's got shrimp, cashews, mango, toasted coconut, onion, red bell pepper, kale, ginger, and loads of cilantro and basil (if there's one lesson I've learned from Plenty, it is that I shouldn't be afraid to really amp up the amount of herbs I use in my cooking). I'm very proud of this recipe - it's pretty freaking delicious. The mango ends up kind of melting into the rice and adding a great sweet fruity note to the sauce. I really loved the combination of the tropical mango and coconut flavors with the local New England kale - all the ingredients really come together into a well rounded, filling, and flavorful meal. Preheat oven to 350 deg F. Spread shredded coconut on a baking sheet and toast in the preheated oven until brown and fragrant, about 5-7 minutes. Remove from oven and set aside. Heat a large heavy skillet or wok over high heat. until hot. Add 1 tbs oil and swirl to coat pan. When oil is very hot, add shrimp and cook, tossing occasionally, until shrimp are cooked through, about 2 min. Transfer shrimp to a bowl. Add another 1 tbs oil to the skillet. Add cashews to pan and cook until lightly browned, stirring frequently, about 2 min. Add onion, bell pepper, and kale and stir fry for 3 minutes, or until kale is wilted and bright green, tossing occasionally. Add mango and stir fry for 2 min. Add ginger and cook for 1 min, stirring constantly. Add rice and stir fry until heated through, about 1 min. Stir in soy sauce, fish sauce, hoisin, and Sriracha and remove pan from heat. Off heat, stir in coconut, shrimp, green onion, cilantro, and basil. Serve hot. Mmmm. Looks yummy. I love adding tropical fruit like mango or pineapple to stirfry. I like the you used coconut, too! Mangoes were on sale at whole foods last week so I seriously STOCKED UP! 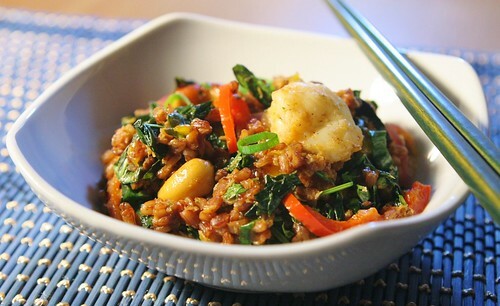 perfect timing to make this delicious fried rice! Adding this to my online recipe bookmarks! I love the sweet-savory-spicy thing going on here! That looks fantastic. YUM! I am loving all the flavors in this! I would definitely order this in a restaurant! You have put some very beautiful ingredients in this rice! I am sure the end result pleased you a lot! I want this now!! I love the sweetness that you added with coconut and mango! I need Plenty!! And this fried rice! It sounds INCREDIBLE :) Glad you've had time to play in the kitchen! I'm a bit jealous, but I've been seriously uninspired... it'll come back, I'm sure, just have to wait it out!